Pack 351 Rocket Blast – and indeed it was! Every year Cub Scout Pack 351 has their annual ‘rocket blast’, in which the cubs fly rockets they have recently bought or built. HARA – in the form of Chuck Pierce and various others who show up to assist – always provides the launch setup and range control, which has been fairly easy for the past couple of years due to the use of the USSRC/Space Camp launch facilities. They have two very nice custom pads built by the “Big E” (Estes Industries) and 3 permanent launch controllers. Like last year, we used the pads in conjunction with our spiffy HARA controller, setting up two banks of 6 (12 total) on one of the Estes racks. Only drawback to this range is the smallness of the field – the surrounding trees look like they have been decorated for Christmas, with all the rocket parachutes and parts hanging from them. Unfortunately, some of the scouts flying today added new ornaments to this garish display, sacrifices to the rocket gods in return for the fair weather. This year’s range volunteers included Chuck, Ray Cole, and myself. We arrived at the field around 9:15 AM, only to find it in use by Space Campers flying their standard rocket – a kit by Estes appropriately called the S.C.R.V. (Space Camp Research Vehicle). I had just installed a new photography app on my iPhone, which had a burst mode among its many features. Though slow (about a second between shots), it did enable me to capture a pic of a S.C.R.V. in flight – one of my better rocket images. After the Space Campers left, Chuck, Ray, and I quickly set up the range, while the scout leaders set up tents for rocket prep and refreshments (ice cream and cobbler – yum!). The scouts got to gawk at a very nice HPR bird Ray brought to display, and, after some opening words from the pack leader and Chuck, they lined up to fly. The first rocket of rack 1 took to the air pretty much on time at 10 AM; for the next two hours the action was non-stop, as the cubs kept coming with their rockets and rack after rack took to the skies. 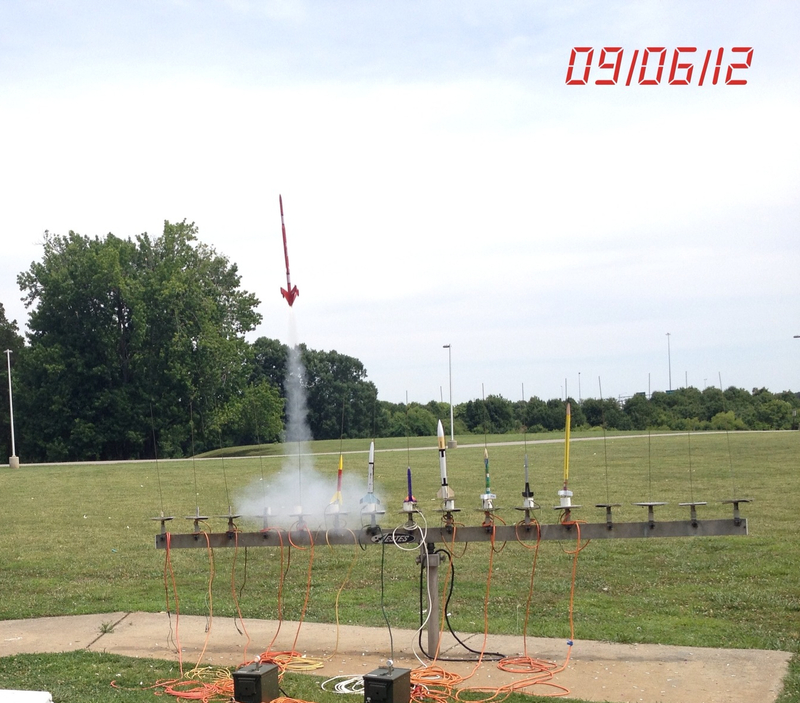 In all, 10 racks of 12 rockets, plus two saucers, flew in 2 hours, for a grand total of 122. Average time to set up and launch a rack: A very good 12 minutes, especially when you count the inevitable igniter failures! 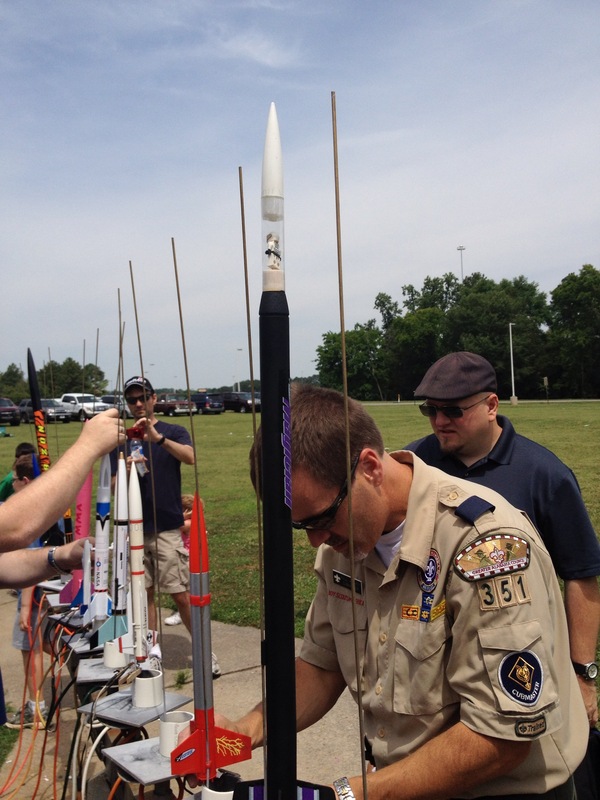 Scouts place their rockets on the pad. Note the Lego passenger in the Estes Magician; after returning unscathed from his first flight, he went MIA on the second when the nose cone separated from the rocket. I was impressed by the variety of rockets this year; in addition to the popular Chrome Domes, Alpha III’s, Gnomes, and EX-200s, there were some very nice builds, such as an EPM-010, a Magician, and a Red Max (which unfortunately was a meal for a rocket-eating tree). Mini Red Max’s were also popular, sporting several different color schemes. The day’s launching ended around noon with two saucer launches. My silver Quest saucer blasted off on a C6-0 with a keychain camera taped to its central tube, enabling me to get my first video from a saucer perspective. Chuck followed up with the coupe de grace, flying the traditional saucer on a G motor; always loud and showy, it delighted the spectators this year with a spectacular cato that sent the saucer tumbling near the apex of flight. Good for them, but bad for Chuck, who had a forward closure trashed in the blow-through. 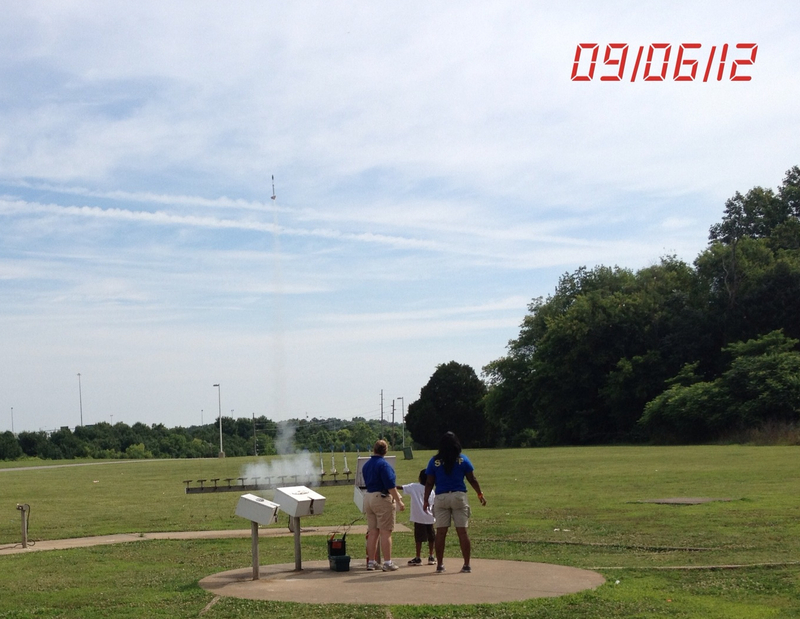 It was a great day to fly rockets! 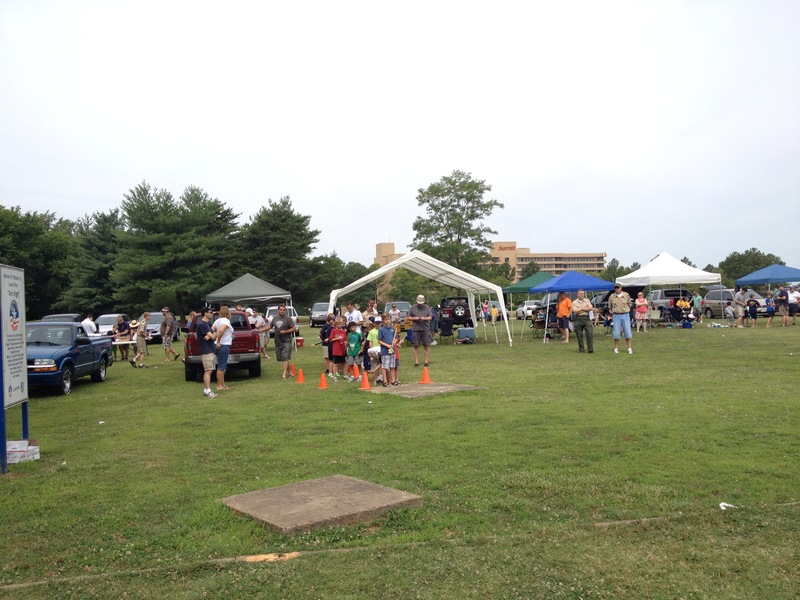 These cub scout events are a lot of fun, and you really should be part of one!